When it comes to plastics, the zombie collector isn’t really spoilt for choice. There are the GW plastic zombies and the Wargames Factory ones, and that’s about it. Of course you can use pretty much any set of plastics and make quick conversions: a lolling head here, a twisted ankle there makes for a nice zombie. Apart from this there are no real zombie plastics that I’m aware of. Ghouls are devolved, cannibalistic creatures that tear and claw at their prey’s soft flesh, ripping it from the enemy before gorging themselves in an unearthly feast. Before battle, Ghouls impale themselves with vicious spikes and deadly barbs, working themselves up into such a blood frenzy that they can shrug off most fatal wounds. Now this sounds really fun, doesn’t it? They’re not really zombies, but the potential is there. 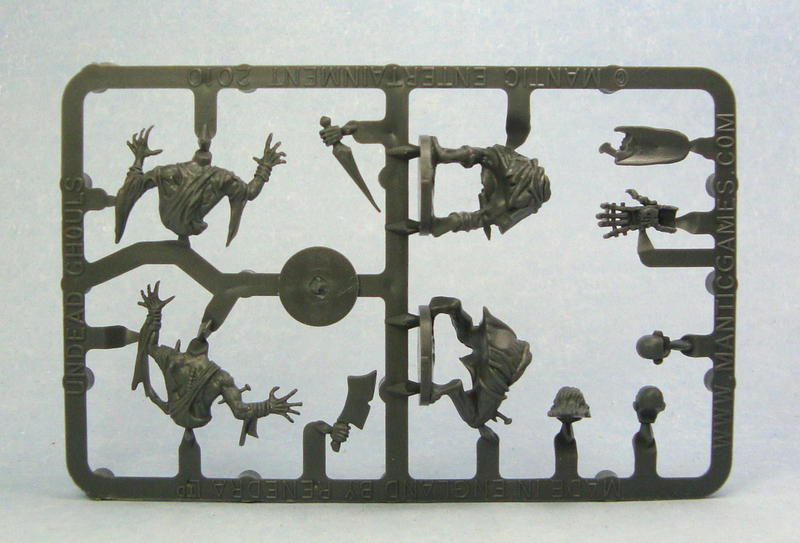 I was lucky enough to be contacted by fellow blogger and DotL reader sho3box suggesting a trade between his brand new set of Mantic ghouls and a sprue of my Wargames Factory zombies. 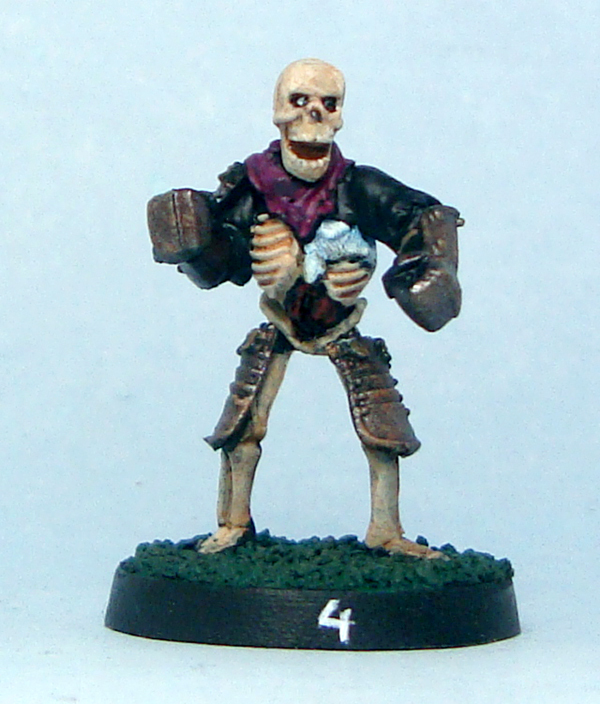 We made the trade and here’s my take on the ghouls. 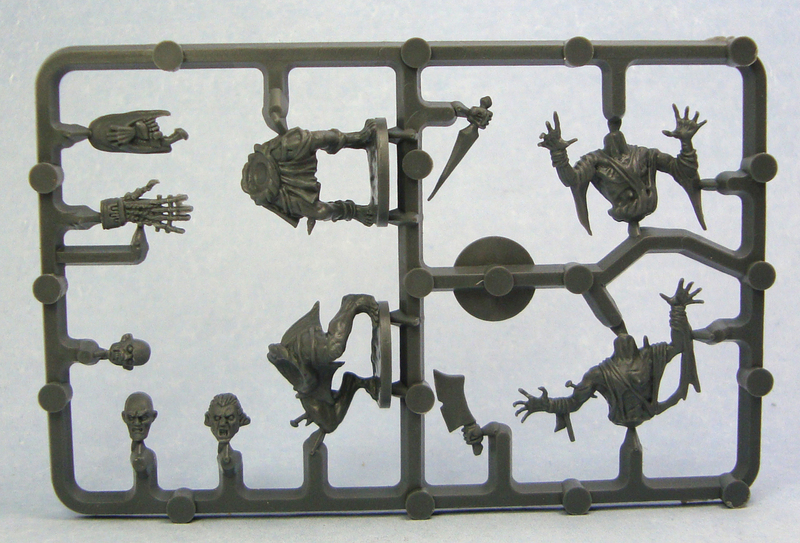 The sprue contains two ghouls, with two different lower and upper bodies. There are three optional heads and three hands with different weapon options – a long dagger, a cleaver and a Freddy Kruger-ish claw thing – plus a bag with a hand and foot sticking out. Sorry for the picture quality, these were a bugger to photograph so I settled for less than perfection. The two torsos are very similar to each other, with raised hands and tattered clothing. The clothing pretty much looks like a shredded toga, so those of us looking for contemporary stuff will have to get creative with either greenstuff or painting. There are the spikes and nails mentioned in the description, which are jutting out from several places around the bodies. I’m of mixed opinion about these. Some of them, especially the nails, are wonderful while others just look a bit silly. Luckily it’s just a quick flick of a hobby knife to rid myself of those. Detail is fairly crisp and looks nice, somewhere between GW plastics and WF, although definitely closer to the former. What was said about the upper bodies applies to the legs as well. The two variants are quite similar with the main difference being that one pair of legs is more bent at the knees than the other. There are the spikes and nails as well, and what was said above could be said again. But I won’t. There is one major gripe however, and that is that the toes on the more bent pair of legs have been mangled by the casting process to the point that the right foot has no toes to speak of. It does not ruin the model by any means, but isn’t a pretty sight either. The three different heads are very crisply sculpted and characterful, and I simply love them. The three alternative heads provided means, that there are always spares and if I end up buying more ghouls, the extra heads will easily find use in conversions. The looks on the faces are wonderfully malicious. And now for the important question: are the Mantic ghouls suitable for use as zombies? That’s both a yes and a no in my view. The intelligent faces and dynamic poses render them unsuitable for classic zombies of the Romero variety, but on the other hand make them excellent picks if you’re looking for 28 Days Later style ragers. The overall look of the ghouls makes them suitable for other uses as well. They’ll naturally be great ghouls, but won’t look out of place as mutants, crazies or feral vampires either. 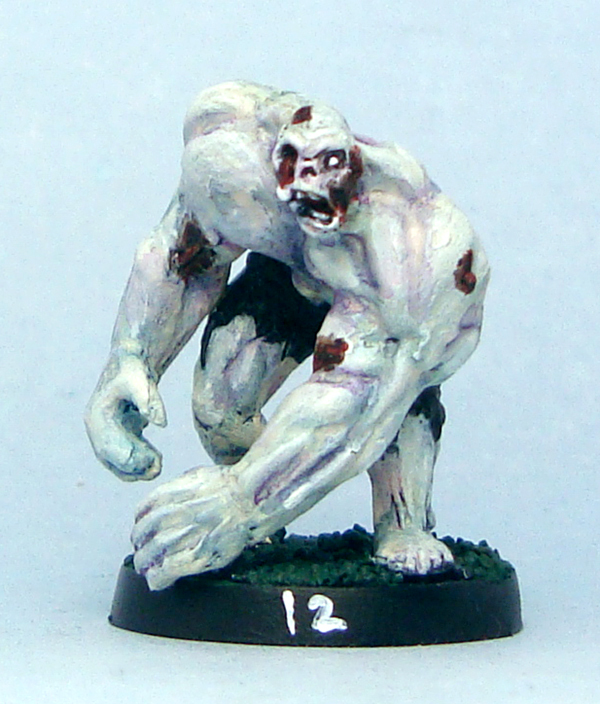 Incidentally, Mantic is producing a set of zombies later on, and I can hardly wait for those. 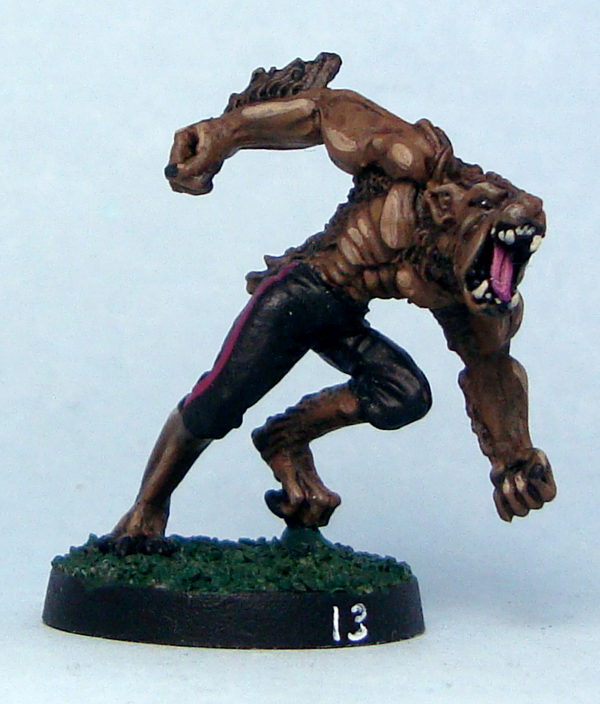 The Mantic ghouls are sculpted by Bob Naismith and come on integral round plastic bases that fit into square “unit” ones supplied with the models. Of course if you’re like me, you’ll just ditch the squares and glue the integral bases to slottas. 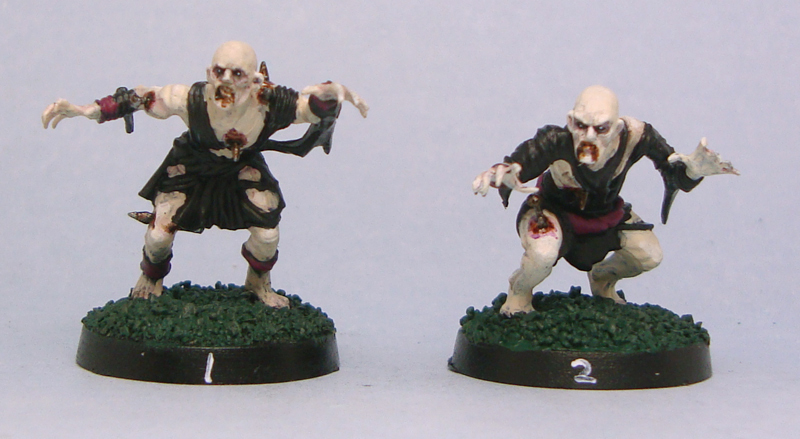 The ghouls currently retail at £8.00 for ten models or £20.00 for 30 models, so the price is alright. They’re available direct from Mantic or from various retailers. Overall verdict: The Mantic ghouls have their uses depending on what you’re looking for. If it’s zombies you’re after, I suggest you look elsewhere or wait for their zombie release. If, however, you want rage zombies, degenerates, cannibals and mad vampires, you should already be placing an order. The miscast toes on one pair of legs is the only real point of complaint here. It isn’t a major one, but still worth noting.